Cleaning the Saildrive cooling water inlet waterways. In the past I’ve had problems with the saildrive waterway becoming partially blocked with mussels which if left unchecked could eventually block or sufficiently reduce the flow of cooling water through the waterway so as to lead to engine overheating. This has been discussed on several occasions in various threads, along with methods used to clean the waterway. Mussels, when they decide to set up home, attach themselves very securely to a suitable surface such that they are not easily dislodged. Also the waterway through the saildrive leg is not straight such that it is not easily possible to poke something completely through the waterway to be sure that it is entirely clear. Over winter while the boat is ashore I check the saildrive as best I can, washing the waterways with a pressure washer and with a bottle brush, but I’ve never been sure that either method has done the job with certainty. Someone suggested that filling the waterway with vinegar would kill and dissolve the mussels and their shells, but to do so the saildrive water inlets have to be blocked in order to hold the vinegar there long enough to do its job. To block up each of the inlets I used a kit that I’d made up as shown in the first photo below. This consisted of two pieces of closed cell foam each large enough to cover all of the side inlets on one side of the drive leg, and each of which was covered by a short offcut of plywood. These were secured in place with two “G” clamps tightened in place as shown in the second photo. Lastly to block the bottom inlet I used a long 6mm bolt with a suitably sized rubber cable grommet trapped between two nuts and washers as shown in the third and fourth photos. This last part of the kit could be inserted just far enough into the bottom hole leaving one of the nuts exposed so that the nut could be tightened with a spanner causing the grommet to expand and seal the hole. Arguably two grommets side by side on a slightly longer bolt would do the job better. With the saildrive inlet valve open, and the hose connecting to the inlet filter disconnected from the filter, though it could probably be left attached, around 600ml or 1 pint imperial (imperial is a bit more than U.S.) of vinegar was poured in and left for 24 hours. Next day all kinds of crud was drained out, though unfortunately I didn’t take a photo of it. So the question is whether it has done the job or not, and I can’t say for sure that it has removed everything that was within the waterway. What I can say is that the kit I’d put together made it easy to do and as I had everything I’d used other than the vinegar within my garage, it didn’t cost me anything. Re: Cleaning the Saildrive cooling water inlet waterways. P.S: Always follow the instructions of the descaling agent. Wear safety equipment! Don´t spill the agent! 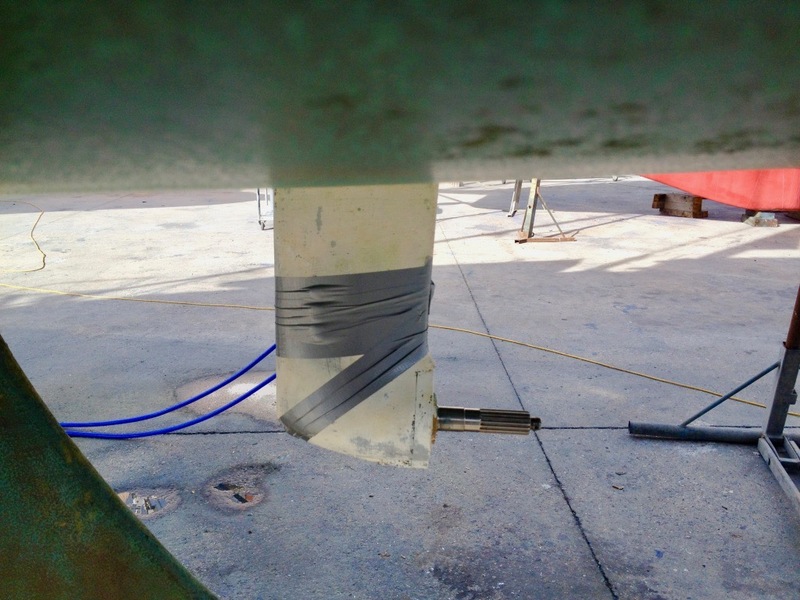 A friend on a similar boat had tried using duct tape just a week earlier, but the vinegar had penetrated through the tape adhesive within a matter of minutes despite having taken several turns of tape around the leg and given the holes a really good overlap. Having seen his problems had me think of a more sophisticated approach. Wouldn't it be a good idea to install a bypass to the saildrive just to avoid overheating if the saildrive is blocked ? I'm thinking of an additional thru hull which is connected by a T-junction to the water hose from the saildrive to the seawater filter. But then you have to find out how the saildrive will fare with no cooling water passing through it. I did that on a previous boat, but it didn’t cure the problem, all it did was to duplicate it and provide an extra possible place for leakage to occur. Also as GeoffV says absence of flow through the saildrive might result in damage due to it overheating. Personally I feel that whatever systems we have on our boats, they have to work properly each and every time they are used. The one modification to the present water inlet system that I would like to see would be for the seawater inlet line within the saildrive to be straight and without any bends in it so that a bottle brush could be pushed all the way through from onboard. That would enable emergency cleaning to be carried out with the boat afloat and would only take a few minutes to do. ......haven't need to use it on my saildrive inlet but have used it on my airconditioning seawater cooling system with great effect. Much quicker than vinegar but costs a little more. Fancy I've done it at the last haulout by stuffing some blu-tack (butyl tape) over the holes and holding that in place with duct tape. Filled the leg with vinegar over night and all kinds of crud came out in the morning too. We also run the engine every two weeks minimum to prevent anything from making its home in there. I would think brick acid might do the job nicely and rapidly. I often use it to get the barnacles off the prop and its components during annual service. Might give this a go when shes next out - how much vinegar was required? On my B36/2002 I used a single 600ml bottle of vinegar. This was plenty, but is subject to having no losses due to leakage. Cost about 37p/bottle from your local supermarket (UK price). Bigger boats with larger saildrives may require more. I’d taken three bottles of the stuff with me, and have enough left over for the next two winter cleanouts. A friend using gaffer tape to seal the water inlets also used three full bottles of vinegar and his saildrive was already empty after a very short period of time due to the leaks resulting from the vinegar attacking the adhesive. The closed cell foam I had came from some packaging for curtain poles and measured something in the order of 4” x 1.5.” As usual it was something that might otherwise have been thrown away, but which looked like it would comfortably fit my “might come in handy” box, while the wood backing was a couple of plywood off cuts. Bav 44 with MS25 saildrive. That’s a neat solution. Wish I’d had time to try it some years back. An engineer made a new water inlet after mine blocked up. There’s been no issues with the saildrive in the last 6 years.